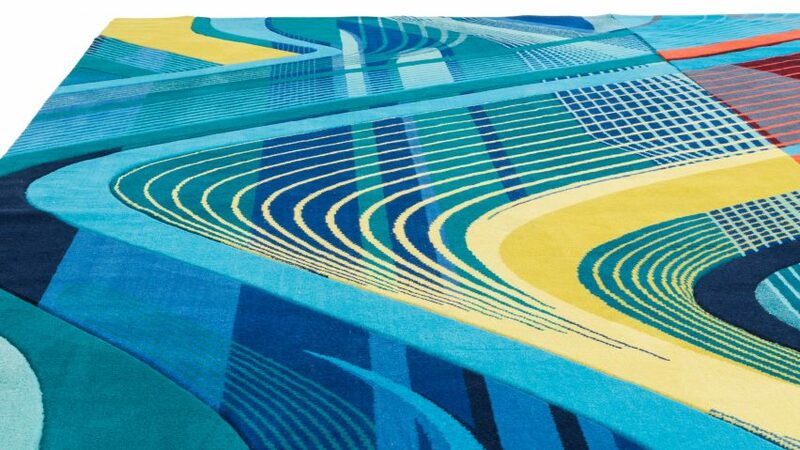 Zaha Hadid Design has unveiled carpet designs inspired by the projects of its late founder, including MAXXI and the Nanjing International Youth Cultural Centre. The designs cover four themes that were typical of Zaha Hadid's work: striated lines, ribbon-like projections, pixelated landscapes and organic cellular shapes. These are applied to 22 hand-tufted carpet designs, woven on Axminster looms. Designed by Zaha Hadid Design for carpet manufacturer Royal Thai, the collection is named RE/Form after the fact that each design represents reconfiguration and transformation. "Patterns within each grouping capture Hadid's signature use of interweaving, layering and play with light and shadow," said the London-based design studio. "The designs introduce custom new colours for Royal Thai commercial carpets, with hues of turquoise, red and green in their colour palettes." The design team highlights the buildings and products whose influence is most easy to spot in the carpets. The pattern of the Striation carpets mirrors Hadid's fluid and futuristic design for the MAXXI: National Museum of 21st Century Art in Rome and the sinuous metallic ribbons that flow across the facade of the firm's recently completed 520 W 28th Street. The pattern of the Pixel carpets recalls the perforated facade of Zaha Hadid Architects' Nanjing International Youth Cultural Centre. Meanwhile, the undulating pattern of the Ribbon carpets is reflected in the interior of the Zaha Hadid Design Gallery in Clerkenwell, London, as well as complex designs like the tangled 3D-printed Thallus sculpture by Zaha Hadid Computation and Design research group (ZHCODE). Finally, the Cellular carpets look very similar to the lattice forms found in projects such as Hadid's white gold Skein Cuff, which the team produced in collaboration with Swiss goldsmiths Caspita. All 22 carpets were on show at The Zaha Hadid Gallery during London Design Festival last week alongside the studio's recent 3D-printed furniture collaboration with Nagami. The showcase also included an exhibition by the studio's Computation and Design research group (ZHCODE). Other rug and carpet designs on show during this year's London Design Festival included a collection of eight carpets by fashion designer Jonathan Saunders, and a selection of 3D printed and upcycled rugs created by designers across the Netherlands.